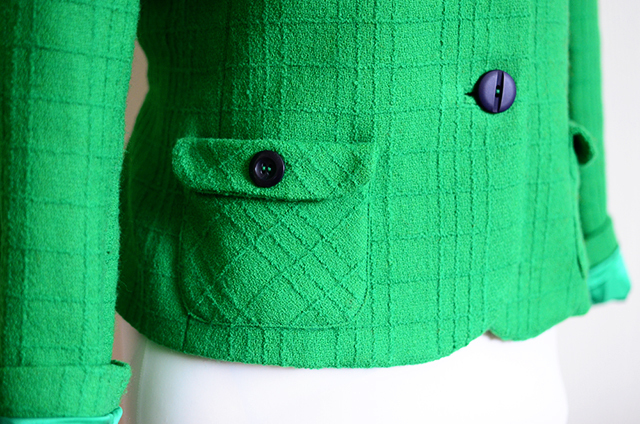 Today, I thought I would answer a few questions I received about my green jacket that I made for Project Sewn. But first. Wow! Hasn't this week been ahhh. mazing? I have to say I think everyone outdid themselves. It's been really really fantastic. So much variety and it was exciting. Forget mind being blown, my brain was blown. Ladies, I bow (and wink) to your creativity and inspiration. Hey now, don't forget - you can still vote for your favorite until tonight! If you haven't already, be sure to hop on over and snag your favorite make. Patternmaking for a perfect fit by Steffani Lincecum - this little underated and not talked about enough book walks you through how to do this. Love it. Steffani also has a Craftsy class on this very subject. Also a worthy investment because you can watch someone doing it. Kenneth King's Jeanius class on Craftsy and also this class on Pattern Review are both about his approach to doing this. You'll find that there are several methods for creating a rub-off and all are worth knowing about. They come in handy at different times. Hopefully this gives you some ideas for how to do this. It's very addictive and well worth knowing how to do. Did I match the plaids on the texturized wool? Funny you should ask because yes, I did. These types of details are important to me, especially now that I understand how it works on a jacket. It's worth the effort to me here and I also did want to see if it really made that big of a difference in a plaid that was more subtle and textural than anything else. Probably not all that noticeable, but it's still a nice touch. Was the waist cincher apart of the original garment? Yes, it was. You guys, this is such an ingenious way to make a boxy jacket look fitted. I love this on my original jacket (scroll down for that). I definitely see more waist cinchers on my jackets in the future. Plus they are cute. There's a myriad of ways that you could do this detail and each time have it look different. 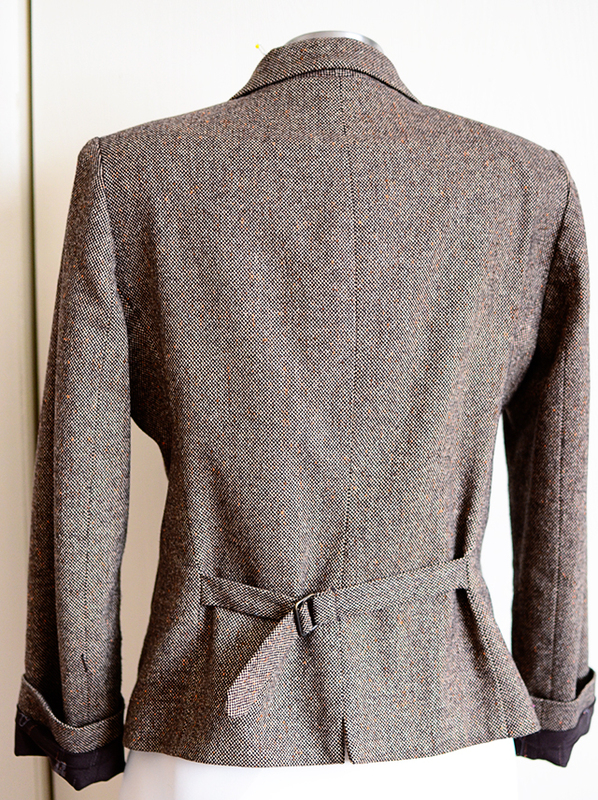 The jacket has three main body pieces. This made it kind of cinchy to match the plaids. The pieces are a jacket front, jacket side and jacket back. The side combines both princess seams from the front and back into one. And now, here's the original jacket. By the way, this thing is pretty old. From my college days when I worked in an expensive clothing store. It's held up well. Except for the lining which I took apart and redid this year. 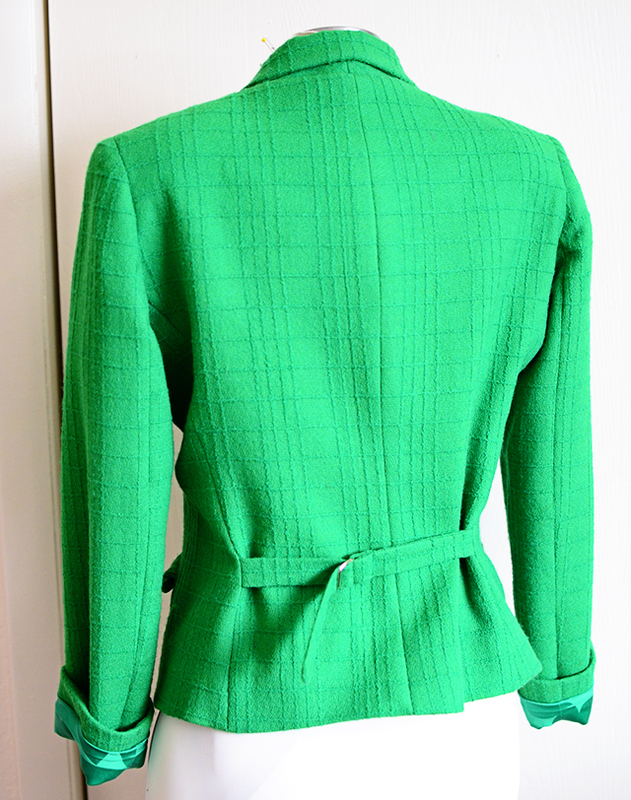 Now it has my favorite lining tricks, including silk sleeves and rayon bemberg lining in the body. Still wearable for years to come. So beautiful! I've done a tiny-tiny version of this on my winter coat in progress, by copying off the collar of an existing coat which is really cool and unique. So far it's worked! But I'd love to learn how to do a full copy in the future. By the way, I'd love to see a posting on all your lining tricks! 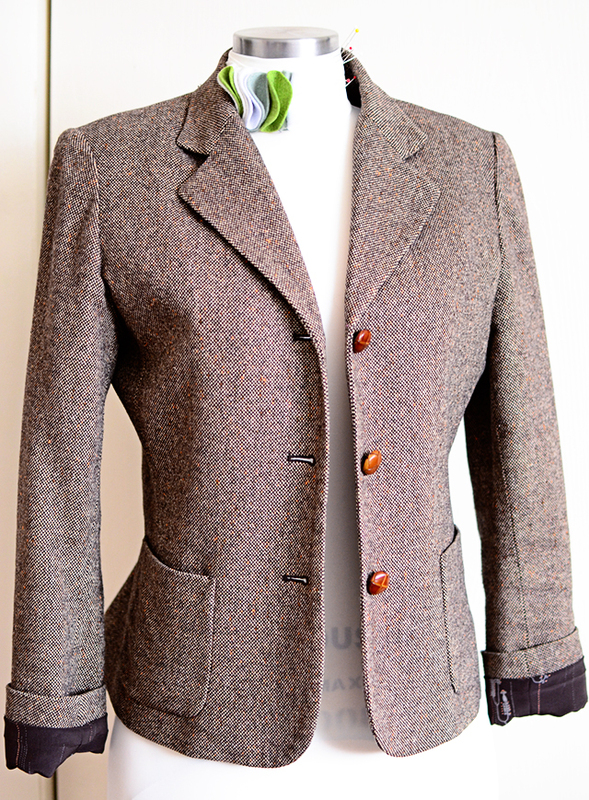 This is a very interesting design/construction as I don't think I have seen a jacket with a side armhole princess seam without front darts (either bust or waist). Sometimes, if the princess seam is more to the front, there won't be darts in the front but here the side piece is really off to the side and doesn't have darts. @zeddie - exactly! I noticed the same thing. And yet, the jacket isn't completely boxy, it still has shape. And in only 3 pieces! I was super excited to get a pattern from this jacket. Well, you may have sold me on rub offs. My very favorite jacket is a thrift store herringbone wool that has an inset belt detail in the back, like an Eisenhower jacket, know what I mean? It is so flattering, comfortable, and darn cute. I get compliments on it every time I wear it. I have not seen a pattern with this detail. I really think this detail fits my style. I even like it in a robe - no more hunting for that dang belt! I guess I will have to add this to my list of must learns. I think this jacket is just gorgeous. It really is a beautiful pairing of fabric and pattern, both of which are perfect for you. I looooove this jacket! Thanks for giving me a closer look! Love the waist cincher detail- how awesome! 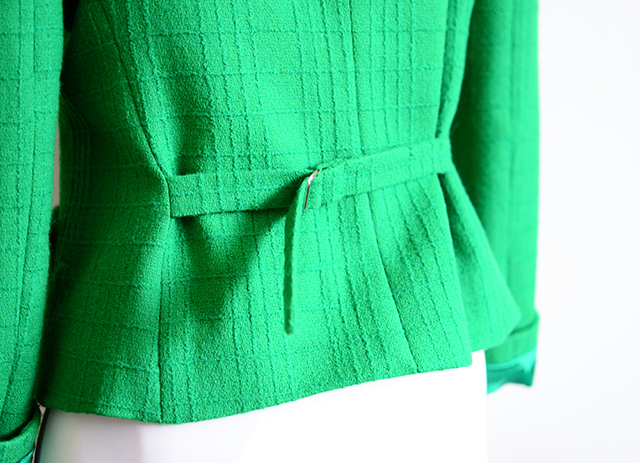 I have a mid-'60's dress pattern for a shift dress that includes a waist cinch/belt thing- there are buttons attached to the body of the dress, then you make a little rectangle with buttonholes on either end and button on. The rectangle's a little narrower than the dress, so it gathers in the back. Older clothes tend to have fun details that are missing from cheap modern clothing! LOVE the waist cincher. I may have to add that to every blazer I ever make. GENIUS. I totally agree that rubbing off a pattern is a very effective way to get a pattern that fits. It's also good for bra making because there many many patterns available. 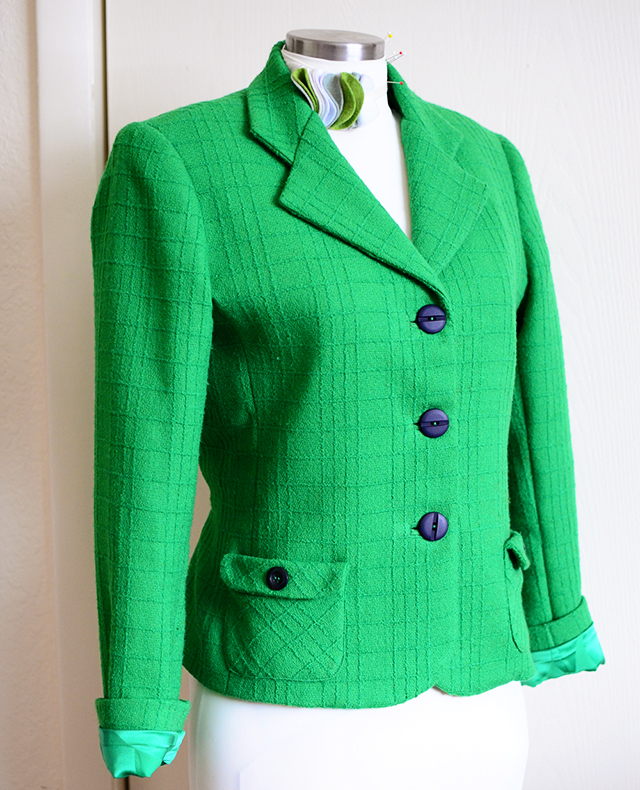 I just love this cheerful green jacket - especially with your coloring. The matching plaids are nice, too! As rub off means something entirely different in my home country of Australia, I like to think of it as reverse engineering. The first thing I reverse engineered was a bias cut nightgown/slip. I had no idea how to draft for bias so tracing the seams of a lovely Natori garment was a quick and dirty solution. A handy technique, to be sure. Great Jacket.Sunni I thought the fabric was beautiful. Do you know of a pattern like this that is available. Or, maybe you should make patterns of the jacket for sale. @futuralon - I also think that Kenneth King calls it that, which is probably much more "socially acceptable." ha ha! @Norma Gordon - Thank you Norma! I will say that I have looked into producing patterns before and its a lot of work. Unfortunately I probably won't be doing that anytime soon and sadly, its one of those styles that I've never seen in a commercial pattern before. So so sad, because it totally needs to be a pattern! I've got Pattern making for a perfect fit and have used it to make a rub off of an A-line mini. I've not tried it on anything as ambitious as a jacket yet. Your jacket is gorgeous, I'm a big fan of green. What a beautiful jacket! I only wish I had a jacket that I loved enough to copy. Love that jacket! I am glad you matched the plaids even if it is very subtle. Those kinds of details really make handmade pieces special. Very beautiful. I am enrolled in both of those classes on Craftsy (Stephanie's & Jeanious). I used Stephanie's technique the other day when my son asked me to make him a shirt just like the one he has from Old Navy but to make it longer. He liked many of the design elements of the shirt so finding a pattern would be hard to duplicate. He's 6'8" and ALL shirts are way to short for him. Knowing how to do a rub-off makes this easy.